Beautiful and private 100+ acre farm near Montville, CT.
eliminate dust during riding lessons. 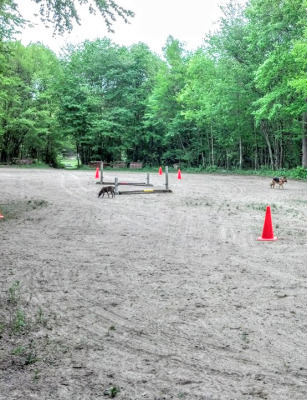 Large outdoor sand/clay arena professionally installed and surrounded by natural stone and trees. Horseback riding fields including cross-country course. Over 2000 acres of trails adjacent to the farm. Full heated lounge with kitchen and DIRECTV. 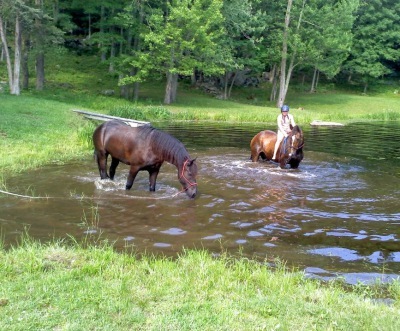 Ponds for swimming (with or without your horse) and fishing. No pressure to buy a horse or participate in horse shows. your horseback riding lesson at beautiful Laurel Ledge Farm near Montville, Connecticut.